Print Book 826 pages in 1 volume (printed book) with downloadable forms Note: For print books, with MCLE's supplementation service, new supplements and revisions are mailed automatically with an invoice. If you do not want to subscribe, please check the opt out option during checkout. An essential resource for any attorney who practices family law in Connecticut, A Practical Guide to Divorce in Connecticut takes you from the first meeting with a client who is considering dissolving their marriage all the way through posttrial motions and appeals. Learn how to fill out a financial affidavit; understand how to use experts to your best advantage, be able to explain to your client about the potential tax ramifications of a divorce and how alimony and child support payments will be treated; recognize the delicate issues involved when representing a child in a family matter, and know the circumstances when alternative dispute resolution options are a good option for your client. Thank you for choosing to update your practice resource library with the 2018 supplement to the 2013 first edition of A Practical Guide to Divorce in Connecticut. involving third parties in the alternative dispute resolution process (see chapter 21). 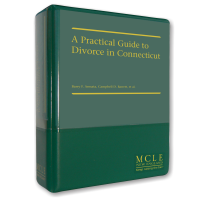 We at MCLE | New England hope that you will continue to find this manual useful in your family law practice and in your law library. Thank you for your continued support.